Yandex.Metrica protects users' privacy and ensures that all collected information is depersonalized. For this reason, certain information such as social-demographic data (gender, age, and so on) has limited disclosure. Such data is provided only if there were more than 10 users in the sample. For example, you want to know the percentage of males out of the total users for the day. When the request was sent, 5 people had visited the site (less than 10). In this case, the report will contain information about the total number of users for the day, but data will not be available for the number of males. Reports provide statistical information about a site and are divided into standard reports (offered by the service) and custom reports. Each report contains indicators separated into groups (for example, the number of males in the total number of users). The report is formed for a specific time period. By default, this is one month. Reports display data in a table and on a graph. You can select a calendar time period to build the report for. By default, one month is selected. You can also set a range of dates by clicking . The “Line” and “Area” graphs display data broken down over time periods. The default setting is auto. This sets a range based on the selected time period and the amount of data that is sufficient for this period. You can refine the time period to minutes, hours, days, weeks and months. You can use segmentation to make reports on sessions that meet certain conditions. For example, you can take the Sources, Summary report data and get traffic only from tablet users. For more information, see Data segmentation. If generating a report requires a large amount of data, collecting this information might take a long time. 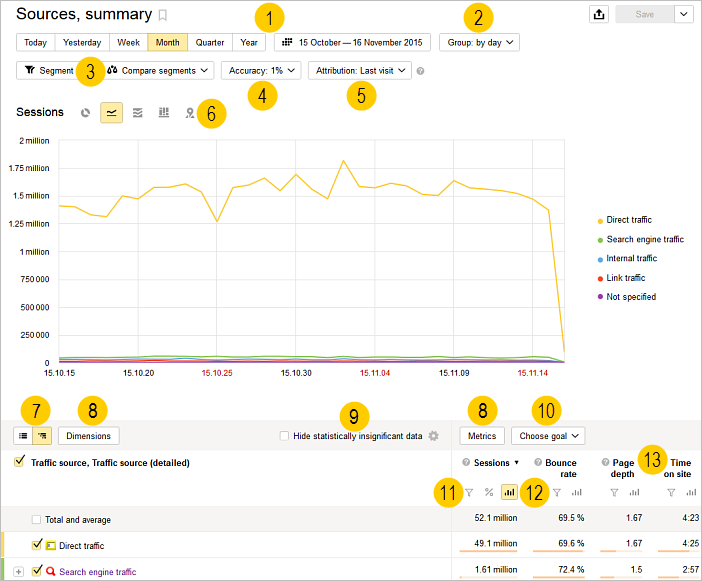 In order to generate the report faster, the service can use just part of the data (for example, 10%). To change this amount, go to the report page in the Yandex.Metrica interface, click Accuracy, and move the slider to the desired area — Faster or More precisely. For more information, see the section Sampling. 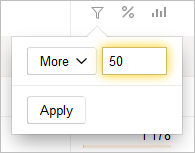 When you switch to a different report, this setting is saved. Information about this appears at the bottom of the screen. You can leave it, or reset it. These help correctly identify the source of a referral, in order to calculate the conversion rate for a created goal. For more information, see Attribution models. Lines — Shows changes to the absolute values of measured variables over time. Pie chart — Shows the distribution of variables by groups. Areas — Shows the dynamics of variables (their values are totaled). Here you can see the total number of sessions over time for each variable given in the key. Columns — Shows the change in the ratio of variables over time. Map — Cumulative data (totals and averages) on the world map and on detailed maps of Russia, Ukraine, Belarus, and Turkey. For example, in the Page load time report, the map lets you analyze the speed of your site's response in different regions. Search is available in this mode. When you use search, the report will only contain the values of groupings (rows) that match what you entered in the search box. For example, in the Entry pages report, you can view data for a specific page by typing part of its URL in the search box. Each report contains metrics grouped into dimensions. For more information, see Obtaining and displaying data. Metrics. 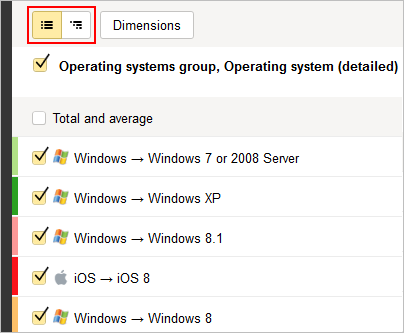 To form a report, click Dimensions or Metrics. In the window that opens, select the parameters to base the report on. They will be displayed in the right half of the window. When you select a dimension, the icon appears next to it. This indicates that at least one of the dimensions from this block is used in the report. Restriction. A report can have a maximum of 7 dimensions and 10 metrics. Metrica provides many numbers on all the possible aspects of how your site works, and all these numbers are accurate in terms of how they are calculated. But this is not always true in terms of site analysis. For example, if a single user visited the site and viewed a page for 20 minutes, it is formally true to say that the average session length is 20 minutes. However, common sense tells us otherwise: we can't make conclusions about a site based on a single session. The service allows you to hide report rows that contain this type of incorrect information. For more information, see the section Statistical accuracy of data. When you select a previously created goal from the list, report data is updated to reflect this goal. 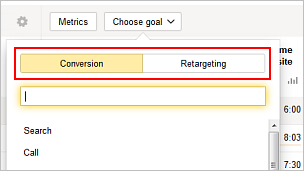 The goals in the list are separated by their purpose: conversion and retargeting. For more information, see What are goals? Types of goals. 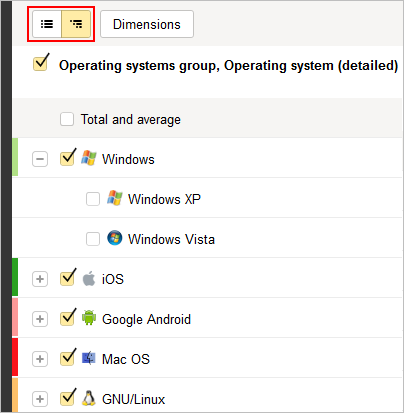 Yandex.Metrica lets you set a numeric restriction for showing statistics. For example, to show information on bounces with a value higher than 50%. To filter the values, click . In this case, the report will show only the rows (groupings) that have metric values matching the condition you set. By default, the graph shows values of the metric that data was sorted by. To show a graph for any other variable that is available in the report, click the icon. The graph will be updated. By default, report data is sorted by the first metric (for example, by sessions). To change the sorting, click the metric that is more important to you. Federal holidays are shown if Yandex.Metrica identified the region for the tag. Sometimes traffic fluctuates over long holidays. For instance, traffic to travel sites increases before extended holidays. Results of checking site availability. Appears when the site is unavailable (the server response is something other than 200 OK), and then appears again when the result changes. This note might explain a sudden decrease in site traffic. For details, see Notes on graphs. To create a new report, select Reports → My reports in the menu and click the icon. By default, this report has the Sources, Summary report type. Then make the desired changes. We recommend making custom reports by editing the standard reports. After making changes, you can save the report with the previous name by clicking Save. To save it with a new name, click and choose Save As. Then enter the report name in the window that opens. After saving, the report will be available in the My reports section. Other actions with reports are also available in the service. To export the report results to PDF, XLSX, or CSV format, click the button. The first 100,000 lines of the report are put in a file of the selected format. To rename a saved report, click and choose Rename. In the window that opens, enter the new report name and click Save. To delete a saved report, click and choose Delete. You can't restore a deleted report. Note. Editing, creating, saving, renaming and deleting are all available if you are the owner of the Yandex.Metrica tag, or you have representative access or editing access.